As our Kentucky grown hemp-derived products make their way around the world, we are pleased to be a part of the economic re-purposing of Kentucky family farms, facilities, and personnel. As we celebrate Independence Day, we celebrate the spirit of the American family farmer, and pay homage to the value systems that the agricultural community brings to our great country. From our Kentucky home, we recognize the tremendous effort and persistence that generations have given to drive this industry forward. We carry these traditions on in 2018 by galvanizing momentum for the Farm Bill -- bringing together grassroots organizations, hemp product manufacturers, family farmers, and industry advocates from all walks of life in support of the full and final legalization of hemp and hemp-derived products. GenCanna™ is proud to be entering our fifth outdoor growing season through the Kentucky Department of Agriculture’s Industrial Hemp Research Pilot Program, and this season plans to put more than 2 million hemp plants in the ground on family farms in Clark County, Harrison County, Garrard County, and for the first time ever, in Western Kentucky’s Graves County. Always Kentucky Proud™, GenCanna’s compliant program partners with the finest greenhouses in Bourbon County, Garrard County, Scott County and Clark County, and family farmers to produce high quality hemp from our unique genetics and agronomic model, and shares a special relationship with the legislators and hemp industry advocates of the Bluegrass State. We are proud of our Kentucky roots, and fortunate to conduct our efforts in conjunction with the nation’s most successful and innovative agricultural department. As our Kentucky grown hemp-derived products make their way around the world, we are pleased to be a part of the economic re-purposing of Kentucky farms, facilities, and personnel. 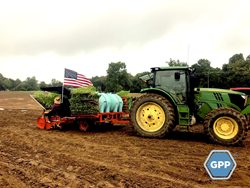 The history of hemp in our country is deep and nuanced -- and we are excited to be at the forefront of bringing this multi-faceted product back to a primary position in American agriculture. We celebrate the freedoms granted to us by continuing to help family farmers farm a crop that has tremendous benefits in places where tobacco once dominated the landscape. This day is not possible without the ultimate sacrifice given by our women and men of the military, and we honor them with our commitment to representing the core values of our country through our work every day. GenCanna Global, Inc.™ is a vertically integrated industrial hemp cultivator and processor located in Winchester, Kentucky. GenCanna™ strives to leverage resources at its Hemp Research Campus to educate and enroll the local community and farming partners. In collaboration with state universities and local agencies, GenCanna™ will continue develop and deploy novel cultivation techniques that enable Kentucky to be the leader in the hemp industry (learn more at https://gencanna.com/agriculture/). GenCanna™ sustainably grows premium hemp cultivars on fertile Kentucky family farms, and crop processes the harvest for sustainable feedstock. Consistent extraction methods and innovative processing technologies ensure the process exceeds all regulatory standards for the FDA registered and inspected food production facilities (learn more at https://gencanna.com/compliance/). The GenCanna Production Platform™ assures standardized, repeatable quality from farm to finished product. More information about GenCanna Global, Inc.™ may be found at http://www.GenCanna.com.